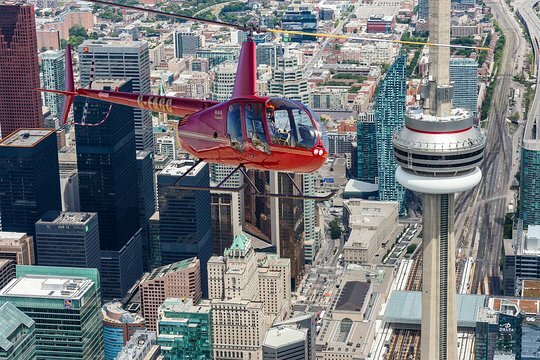 Get a unique perspective on the Toronto skyline with this 7-minute helicopter tour that won’t break the bank. 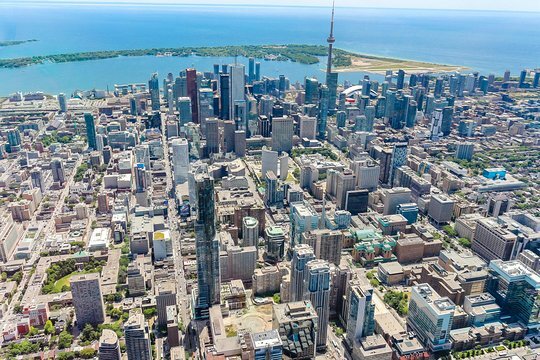 Covering nine miles of the city and surrounding landscapes, the tour provides aerial views of the CN Tower, St. Lawrence Market, National Exhibition grounds, and bustling Bloor Street. A choice of departure times adds extra flexibility, and you’ll go home with a souvenir photo and memories that will last a lifetime. Make your way to Billy Bishop Airport conveniently located in downtown Toronto. A range of departure times is available to suit your schedule. 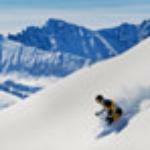 After an introduction and safety briefing, climb aboard the helicopter and take off for a 9-mile ride over Canada’s largest city. Viewing Toronto from the CN Tower or harbor cruise boats can’t compare to the views you’ll enjoy from 2,000 feet in the air. Live the moment as you fly over the city’s major landmarks, including the National Exhibition grounds, St. Lawrence Market, and the Royal Ontario Museum. After an easy seven minutes, the tour ends back at Billy Bishop airport. Unlike most helicopter tours, you’ll walk away with a complimentary souvenir photo of your memorable experience. Surprised My GF Last Week And She Loved IT!!! Amazing experience! You feel safe and it's a lot of fun! They are extremely organized. Bravo!!!!! The location is super convenient. The staff are welcoming, professional and friendly. Fantastic views, great organisation. A little short, but exactly as expected. My only surprise was that we did not get any live commentary during the flight, I think it would have been nice. Otherwise, really worth it and lasting memories. Thanks! Get quick answers from 7-Minute Helicopter Tour Over Toronto staff and past visitors. When do you start booking tours in June 2019? Summer does tend to be busy and more tours are pre-booked. I would suggest weeks in advance. Maybe even a month prior to the event. Can I take my 3 year old daughter on the helicopter ? I dont think age is a factor for them..more so weight restrictions. But you can always give them a call thru website # and double check.